Of the many systems that make up a home the rain gutter is the simplest to clean and maintain, but yet the most neglected. While the gutter may be the simplest to clean, the unmaintained gutters system is responsible for damages excess of $50,000.00. To avoid costly repairs, rain gutter care and maintenance is a must. Below are a few simple task that should become regular home care task at least three to four times a year. 1. A splash block should be placed at every gutter down spout with an open diverters. In a close gutter system, the down spouts and the diverters empty into a tight line system (empties into a pipe in the ground). An open system the diverters empty onto the splash blocks. The splash blocks should be sloped so the rain waste water flows away from the foundation. 2. It’s a good practice to inspect the inside and outside of mitered corners of the rain gutter system. Leaks at the mitered corners will cause water rot, to the fascia board that runs along the roofs edge. Should a leak be discovered, a quick, inexpensive repair is a product called “Flexpaint”. The repair method is very simple, and will require a good sturdy ladder. Make sure the ladder is placed on stable ground before climbing unto it. Flexpaint comes in a verity of custom colors with which must be ordered. The basic black, white, and clear colors are stocked at most home improvement stores. 2A. A quality repair will require all the lose debris to be removed from the leaky seams. Next shake the paint up and shoot Flexpaint at the effective area. Read and follow the directions printed on the spray can. 3. 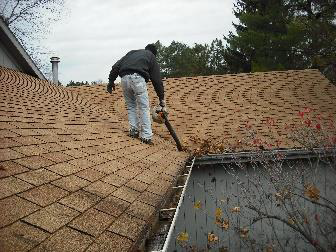 There are several methods to clean out the debris from the gutters. Simple hire the task to be accomplished by a license and bonded professional. a. This method requires access on the roof. Use a sturdy ladder to convess the roof. Next walk around the roof edges using a low powered lawn blower. 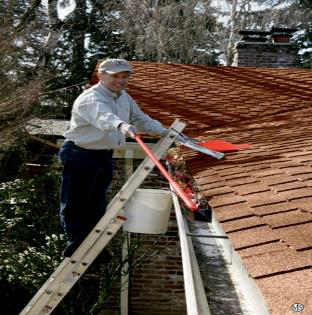 While this method of rain gutter cleaning may be messy it is fast and requires little energy. This method is the best when there has been no fain for a couple of weeks. b. 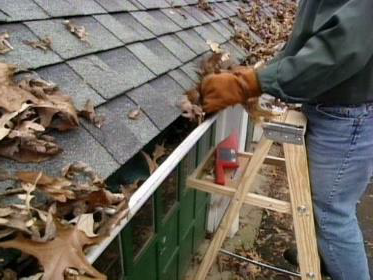 The final method for cleaning your rain gutter system is the old fashion way. This races to require the use of a good stable ladder, small bucket and a plastic shovel or scope. (Available at most hardware stores) Use the scope or shovel to scope of the debris out of the gutter and dump in the bucket. This processes is time consuming because it requires having to claim up and down the ladder, moving the ladder around the perimeter of the home every time the bucket gets full. The frequency in which one is required to clean the gutters, ultimately depends on how many and what species of trees surround the home. Depending on the type of trees surround your home, there is always the option of the “Leaf Guard” type of gutter system. What every method you choice to use, when planning on doing the gutters in your home always remember to be caution and safe.